We’re excited to announce that Tableau Server is now available on the Azure Government Marketplace, which means it can be deployed in just a few clicks within the strict, exclusive boundaries of Azure Government. Because data is a huge strategic asset in all aspects of government, it has enormous potential to increase transparency and improve mission-critical outcomes. Currently, a range of Federal, State and local organizations, from The Department of Veterans Affairs to the Virginia Department of Transportation, are using Tableau to deploy their data at scale and empower their users with governed self-service analytics. This exciting news follows our launch a year ago on the public Azure Marketplace, and will make it easier for new and existing government customers to get Tableau Server up and running in Azure in just a few clicks. This process keeps procurement straightforward and can work directly through your existing Tableau purchasing agreement. Favorable economics and the benefits of flexibility and data gravity are increasingly leading several of our government customers to deploy Tableau in the cloud, so Tableau has been partnering closely with Microsoft to power government businesses in the cloud. This movement is aided by new regulations at the federal and state level that continue to help ensure that data in the cloud is secure and safe from any kind of breach. We’ve found these pre-configured Marketplace deployment options to be a great way for customers to get Tableau Server up and running in the cloud environment of their choice. It’s a simple way to trial Tableau Server, and we see many government customers continue these trials into full production deployments. Some also switch over to a self-deployment option of Tableau Server with more customization and control around the virtual machines, storage, and integration with items like Active Directory. 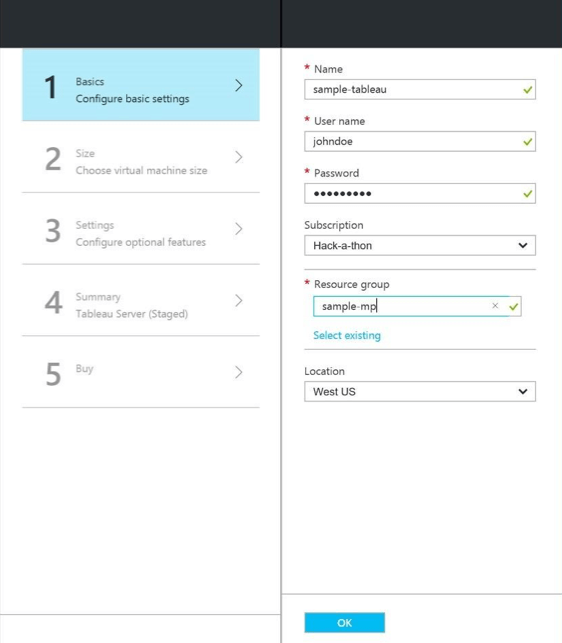 And of course, Tableau lets you analyze all of the data that you have stored in the Azure cloud; from the data you have in Azure SQL DB, Azure Data Warehouse all the way up to the big data service Azure HDInsight. 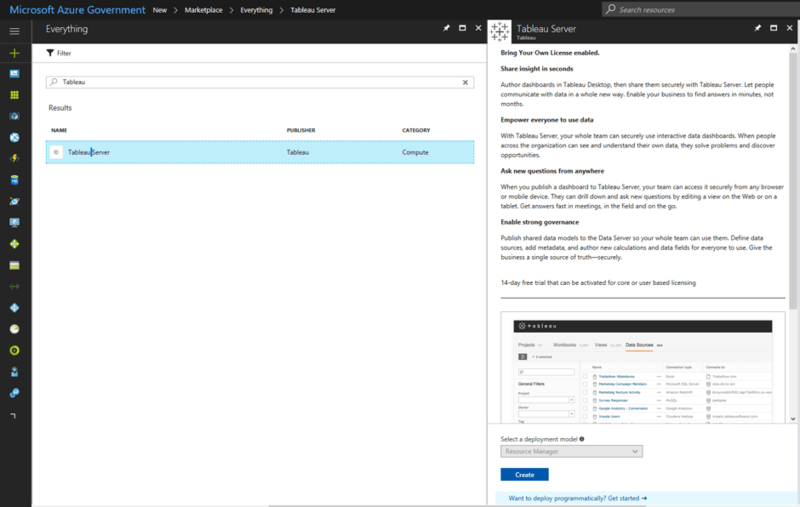 In the following sections, we will cover the basics of Azure Government, Azure Government Marketplace and of course how to run Tableau Server in this trusted public cloud model. 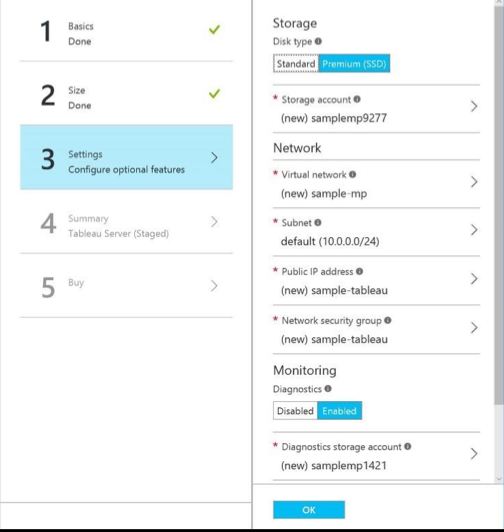 Before you can take advantage of this new deployment option you’ll need a subscription to Azure Government available only to agencies and to vetted partners, and have your Marketplace purchases enabled (see more details on how to do that here). After that it requires just the following simple steps and less than ten minutes to start using your Tableau Server instance. 3. 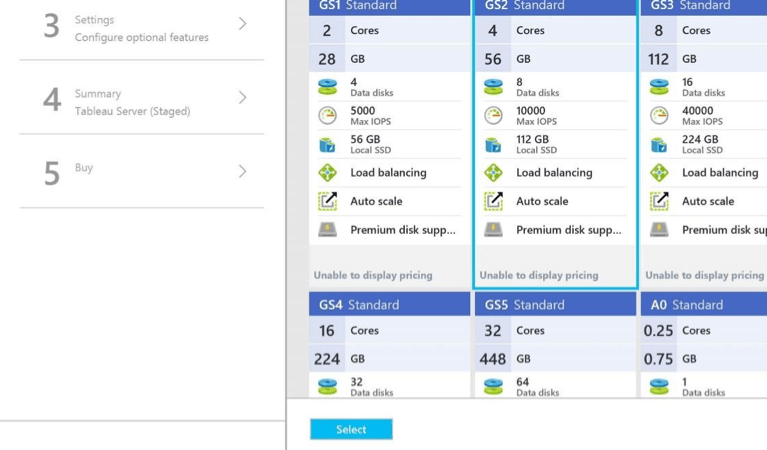 Enter your subscription information, choose a resource group and a deployment location: Remember when you connect with an Azure Government subscription you’ll have access to the government-only and DoD datacenters. 4. Select your Virtual Machine size: Go for the VM size that best suits your needs or opt for the DS13v2 which matches mainstream expectations. 5. 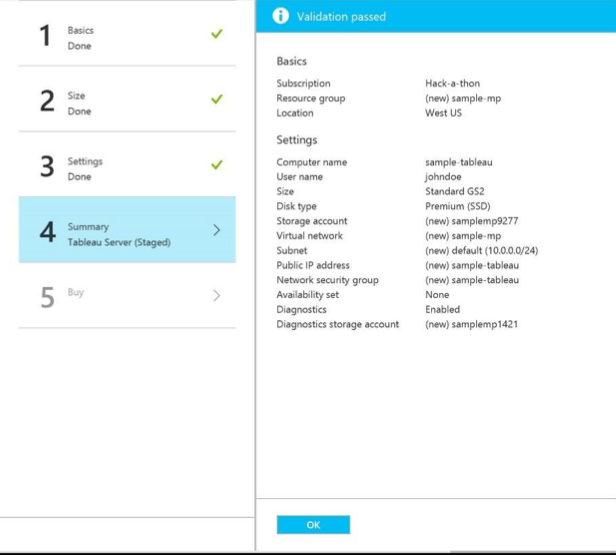 Configure optional features such as your disk type, storage account, subnet, etc. 7. Deploy your Tableau Server instance. It’s that simple! For more guidance about these steps and how to self-deploy via Azure virtual machines, check out the deployment guidelines and best practices whitepaper we published earlier this year. If you do want to go deeper, we also recommend checking out the following resources to learn how Tableau works on top of the Azure stack. We hope this content is relevant to you and we’re really looking forward to reading your comments and updates on how you are leveraging Tableau Server on Azure Government Marketplace. This is a collaboration between Tableau and Microsoft Azure Government and One Commercial Partner Team.